Today’s gift guide is for the women in your life. Mothers, aunts, sisters, friends. These gifts are all unique, but some of them are perfect for the person who has everything and are a little hard to shop for. If you are still looking for unique gifts for her, the unique lady on your list, this post is for you. (Plus, gift-buying procrastinators are my kind of people). For the friend who loves putting their best face forward. Have you ever used a water flosser or electronic toothbrush? The dental hygienists in our family highly recommend them for maintaining oral health. Years ago I used an electronic toothbrush, but what I really needed was a water flosser. I have what are called “close contacts,” meaning that my teeth are really REALLY close together and it makes regular flossing difficult. My floss always has a hard time passing between my teeth and tugging usually follows to get them out. The Waterpik: Complete Care 5.0 Water Flosser and Sonic Toothbrush makes the perfect gift for the woman who values her health (and, let’s face it: beauty). This gift is really two gifts in one because you get a sonic toothbrush and a water flosser. When I received this, Brian’s eyes immediately lit up. I had to remind him that it was my gift and not his, haha. He had one years ago and absolutely loved it, so I knew the treat I was in for when I opened this. I am so happy with it and I am positive it is the perfect gift for anyone on your list! Find the new Waterpik: Complete Care 5.0 Water Flosser and Sonic Toothbrush here. For the friend that loves self-care. 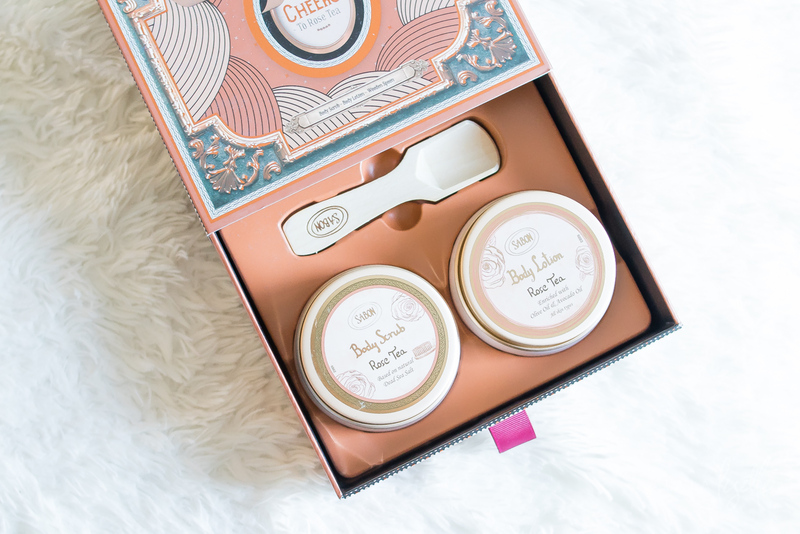 This body scrub and body lotion kit by Sabon is the perfect gift for the friend that loves bubble baths and taking care of themselves. If the name didn’t give it away, the scrub and lotion are rose scented, but not in the powerful way that some artificial scents can be. These bath and shower products have a softer sophisticated scent, much like the English in my garden, and would make a perfect gift for Mom. I was lucky enough to experience Le Tote for myself this past month and I am in LOVE. The red cold-shoulder top, faux leather pants, handbag, and the faux leather jacket were all in my tote. You can see the rest of the items I received in my tote here. Le Tote is a fashion subscription service that is specially curated just for you and your tastes. Plans start at $50 a month for 3 garments and two accessories. You take a short quiz when you open your account, and a stylist prepares a “tote” for you with your items. You can, of course, swap out any items for others to your liking on your site (I did this!). You can wear them for as long as you like. Once you’re done you can return the items and Le Tote takes care of the dry cleaning. In the event where you just can’t part with an item, you can keep it, and your card will be charged a prorated fee for the item. In most cases, the items you pay for are 20% to 50% off retail. It’s a win-win! In case you were wondering, I will be keeping this gorgeous faux leather jacket. I can’t imagine a better gift for the girl who loves fashion! For the fitness fanatic who loves to workout. Because exercising naked is generally frowned upon. All jokes aside, about 15 minutes into my workouts my shirt comes flying off. I have a hard time regulating my body temperature (which is why you’ll find me indoors enjoying the AC on hot days) and why I prefer to workout at home. Arctic Cool launched in 2006 and is known for incorporating cooling technology into its clothing. This technology is called HydroFreeze X. It is a fiber-based, cooling management system, that moves moisture away from your skin and lowers the temperature of the fabric so you can continue your workout and keep cool. Arctic Cool promises its shirts will keep you up to 30 degrees cooler! In the hot climate of Florida (and the humid summers of the East Coast) I’m not sure that I would appreciate a shirt more than an Arctic Cool one! I will probably get tank tops for myself over the coming weeks. Buy Arctic Wear gear here. For the friend who is curious about their background. I have always wanted to learn more about my ancestry and my roots. A DNA test like 23anMe, a nod to the 23 pairs of chromosomes in human DNA, is a perfect gift for anyone on your holiday shopping list. The test doesn’t hurt at all, and there’s no blood involved. You simple spit in one of the tubes provided in the kit, mail it off, and you are notified of your detailed results 6-8 weeks in your online account. Wouldn’t it be perfect to give that person the gift of actually knowing the full breakdown of their cultural background? Order 23andMe between now and Dec. 26 and receive up to $50 off. For the avid iPhone photographer or blogger. Do you have a photographer in the family? How about a blogger? The newest DSLR cameras shoot huge images now, as do smartphones. These images take up LOTS of space on our iPhones and laptops. Wouldn’t it be nice to give someone 200GB of storage in a little wireless stick? The Connect Disk allows you to bak up your data wirelessly. Best of all, if you save movies onto the SanDisk wireless flashdrive, you can stream them to 3 different devices at the same time! Get the SanDisk Connect Wireless USB here. Which of these unique gifts for her will you go with? P.S. If you still need gift ideas for HIM, I have suggestions here.